Brand: Paola Reina/Las Amigas Eye type: Blue/ Fixed Size: 32cm/ 13" Hair: Light Blonde/ Rooted Articulation: 5 points Claudia is one of the Las Amigas or "Friends" collection from Paola Reina. Her light blonde hair is new this year, so she's a super doll to buy for someone as you can be sure that she's not already a doll they have! Claudia is 32cm tall, is made of vinyl with blue fixed open eyes, and fibre eyelashes. Her vinyl is infused with a light pleasant vanilla scent, which children love. Her sparkly navy jumper dress, faux leather beret and co-ordinating tall black boots are very stylish. There is more clothing and shoes for Claudia to wear, in the My Doll Best Friend shop. Paola Reina was established in Spain in 1994 and has achieved worldwide success with its beautiful dolls. 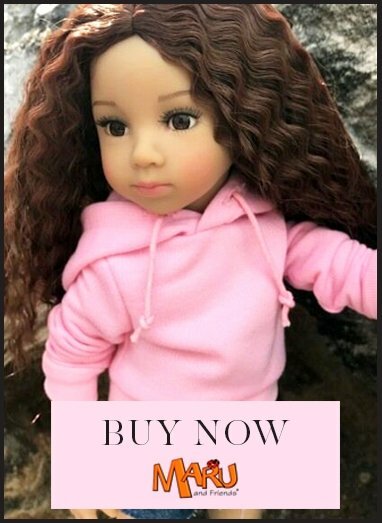 Paola Reina Las Reinas dolls are thoroughly European as not only are they made in Alicante in coastal eastern Spain, all their component parts are sourced from Europe.